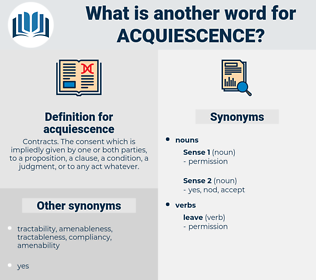 What is another word for acquiescence? Contracts. The consent which is impliedly given by one or both parties, to a proposition, a clause, a condition, a judgment, or to any act whatever. 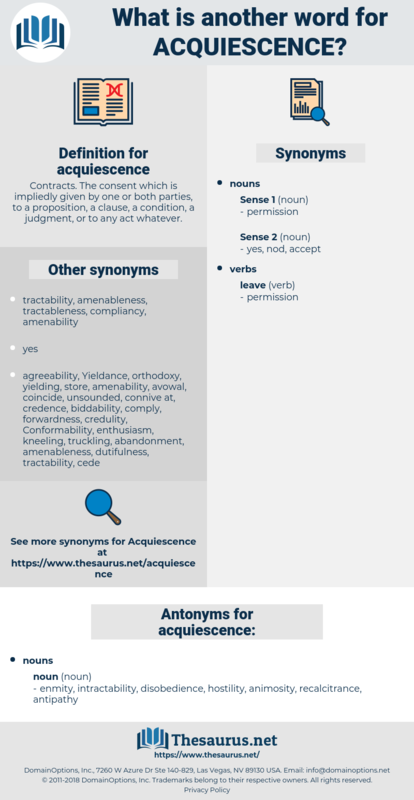 approval, endorsement, Privity, compliance, blessing, acceptability, go-ahead, accordance. connivance, concurrence, acknowledgement, collusion, tolerance, complacency, indulgence, complicity, permission, leniency, backing, toleration. enmity, intractability, disobedience, hostility, animosity, recalcitrance, antipathy. Is there no way either to win or force Von der Tann to acquiescence? There was no sequence in his acquiescence, however. agnize, aching, assamese, achimenes, acinous, awakening, agenesia, akinesia, auxinic, axenic, assigning, agenize, aquinas, agonise, assuming, ageing, acinic, agency, Ashkenazi, acinose, assonance, acinonyx, agenesis, agnise, acinus, agamous, aging, agenise, agnosia, acinos, aconcagua, Aegean Sea, akinesis, asking, agamic, agonus, agonize, Asanga, askance, azonic, accusing.